Recently I noticed that some of my Japanese friends who have small children often talk about “Yokai Watch” on their Facebook posts. I had vaguely wondered what Yokai Watch was, but then I came across an article about it while browsing the internet earlier. Roughly speaking, Yokai Watch seems to be the next Pokemon. Pokemon is a shortened version of “Pocket Monsters”, and “Yokai” is a Japanese word that refers to supernatural monsters, so it is easy to imagine those two are similar. Yokai Watch was also originally a role-playing computer game for the Nintendo 3DS, and soon grew to become a Manga and an anime as well. The story is as follows; One summer day, the main character called Keita, meets Whisper, a yokai. Whisper gives Keita a special wristwatch. Only while wearing this watch can Keita see various yokai that exist in his town. Together, Keita and Whisper have battles with mischievous yokai monsters, and can become friends if they win. Other characters, such as a cute girl friend called Fumi-chan, a wealthy and a theoretical friend called Kanchi, and a bully called Kuma, appear in the story. This combination of characters might have reminded you of something… Yes, Doraemon! Yokai Watch blends elements of two very popular anime/manga (Pokemon and Doraemon), making it seem familiar and more accessible. And now “Yokai Exercise”, the ending theme song, seems to be gaining more and more popularity. The counter on Youtube shows 12,000,000 hits! I’m quite sure that this song will become your ear-worm today 😉 Let’s check it out! Lastly, I would like to share another video. 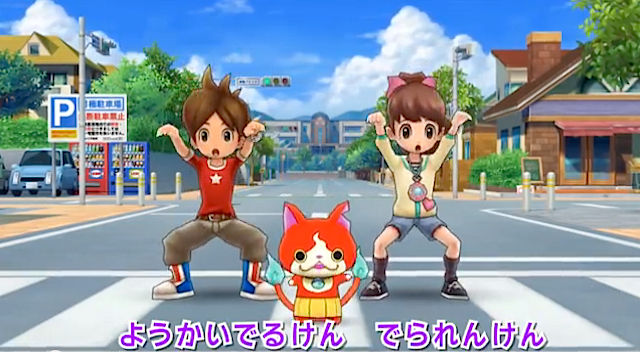 Yokai Watch seems not only to attract children’s attention, but to charm adult hearts as well. It’s kind of funny that such an ordinary looking man dances the “yokai exercise” VERY seriously.